World premiere of Chasm at the Music11 Festival in Blonay, Switzerland. 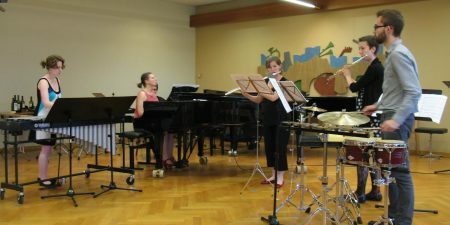 Live performance at Music11 Festival, June 29, 2011. In Chasm the ensemble presents two different types of music simultaneously. The first is beautiful and sensuous; a slowly moving harmonic progression endlessly cycling. The second is percussive and rhythmic, full of contrasts; a dramatic interplay of different sounds. These two different feelings co-exist throughout Chasm, sometimes meeting, but for the most part content to evolve independently.